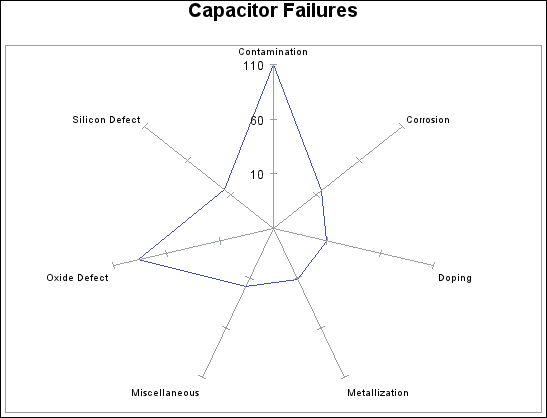 The GRADAR procedure creates radar charts, windrose charts, and calendar charts. Note that the GRADAR procedure is not supported by the Java device divers. Radar charts show the relative frequency of data measures in quality control or market research problems. 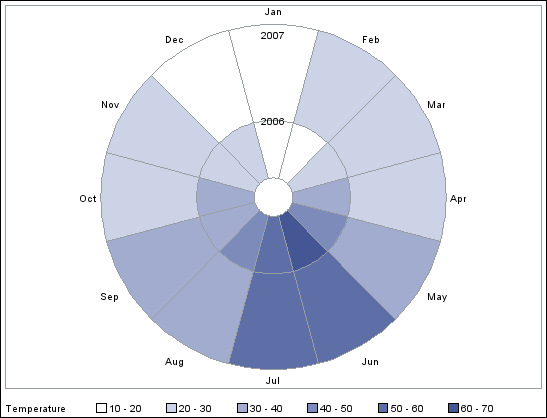 The chart statistics are displayed along spokes that radiate from the center of the chart. The charts are often stacked on top of one another with reference circles, thus giving them the look of a radar screen. By default, the chart vertices—the points where the statistical values intersect the spokes—are based on the frequencies associated with the levels of a single numeric variable. Non-integer values of the chart variable are truncated to integers. The measures can be displayed in decreasing order, the order in which they appear in the input data, increasing order of internal values, or lexicographic order of variable names. Radar charts are sometimes also called star charts. Calendar charts display 12 equal-sized segments, one for each month of the year. The color shading of each segment represents the magnitude of the frequency variable. A windrose chart displays wind direction and speed over a period of time at a specific location. 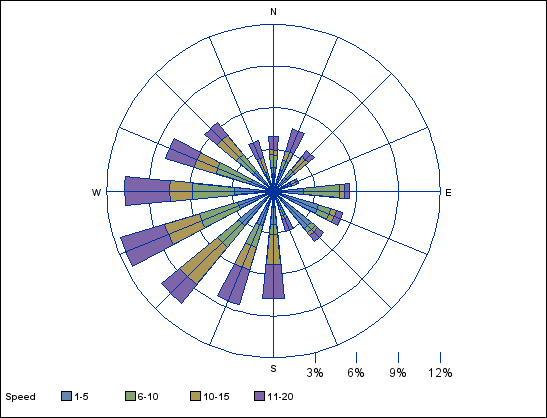 The segments in a windrose chart represent the percentage of time that the wind blew from each direction. The wind data must be sorted by direction. You can enter data for four, eight, or sixteen compass points.